Thanks again to the guys at MobileZap for sending over Avantree Hive bluetooth headphones to review. Pairing worked perfectly. 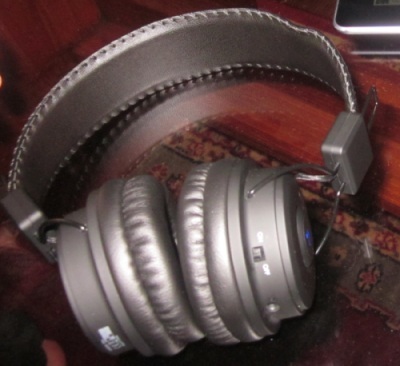 Theres no need to enter a passcode (like other bluetooth products) when pairing these headphones - they ‘just work’. After figuring out that volume control is done via the Nexus 7 buttons and not the volume rocker on the headphones I was plesantly suprised by the quality of the headphones. The sound quality is good, its not going to beat any $300 alternatives but for the price exceptional. The build quality is a plastics and faux leather which for the price is expected and fine. On the right earphones there are controls for play/pause, answer/hang-up calls, volume and next/prev. Volume control can only be done from the Nexus 7 itself. The volume rocker on the Avantree Hive don’t work with Android. This is a common problem for bluetooth headphones as bluetooth is implemented differently on iOS and Android. The next and previous controls work fine though. The USB charger cable plugins into the 3.5mm jack in the headphones. This works fine but would be great if you could recharge the headphones using the same cable (USB micro) as the Nexus 7 to reduce cable clutter. If your after bluetooth/wireless headphones for your Nexus 7 and don’t want to spend hundreds on Beats by Dre than I can highly recommend the Avantree Hive. They work great with a few minor issues, for the price they can’t be beaten by any other over the head bluetooth headphones.